Last night the world went mad over the devastating knockout Holly Holm dealt to UFC celebrity and current media sweetheart Ronda Rousey. 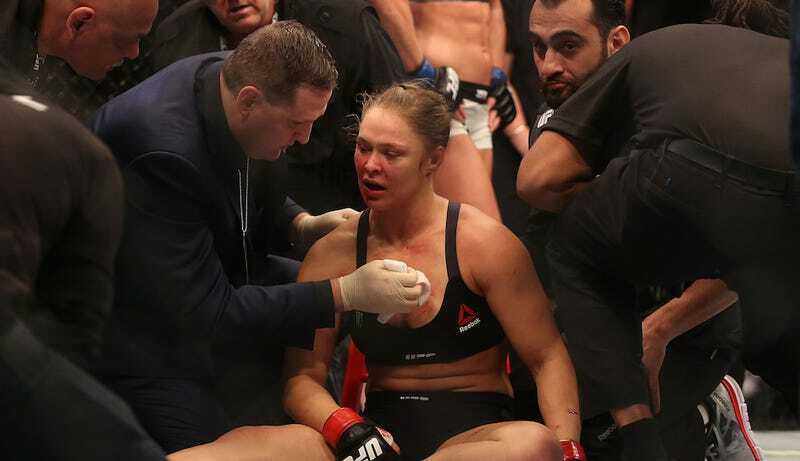 Now, news has been released that Rousey had to be hospitalized immediately after the fight. Ronda was knocked out in the 2nd round after taking a crushing kick to the neck by Holly Holm ... medical personnel rushed to her side in the octogon. It’s Sunday! So here’s a video of guinea pigs discussing pumpkin spice season. Big ups to whoever was able to get a costume on their tiny critter friends without having poop expelled directly into their face at high speeds. Thanks, Anna Merlan/Obama.